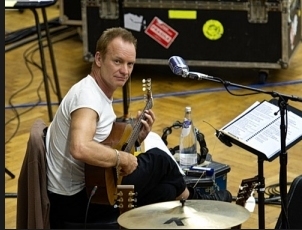 Sting announced his forthcoming world tour and orchestral album Symphonicities with an intimate gig at the iconic Abbey Road studios. The singer, songwriter and former Police frontman played five songs from different stages of his career, backed by the Royal Philharmonic Concert Orchestra. On this showing, it's a potent pairing. Sting sat at the microphone amid the 50-plus classical musicians with the assurance that comes from having sold about 100 million albums worldwide. Having won several Grammys and been made a CBE probably helps too. Newly shorn of the beard that gave him something of a priestly air, he looks lean and much younger than his 58 years. The elegant melancholy of An Englishman in New York, his tribute to Quentin Crisp, gained depth as well as a bongo solo and a call and response ending with the whole orchestra. I Hung My Head benefited hugely from plangent woodwinds and fluttering strings. My Ain True Love, which he composed for the movie Cold Mountain, was stripped down to its Celtic essentials, while Every Little Thing She Does Is Magic bounced exuberantly off the walls. As a bonus, he gave us Next To You, the first song from the first Police album. This hectic, punky number worked surprisingly well with a big band behind it. With an estimated fortune of 2.8 million, and one of the happiest marriages in showbusiness to his film producer wife Trudie Styler, Sting could be forgiven for taking it easy but he said: "I'm like a kid with a new train set." Maybe seeing one of his six children, Coco Sumner, take up the musical baton has re-energised him. Symphonicities continues his restless exploration of the possibilities of music. He recorded an album of Elizabethan lute music in 2006, first experimented with an orchestra in 2008 and released his first, gold-selling album of Christmas songs, If On A Winter's Night, last year. This is Sting's first major tour since the sell-out Police reunion with former cohorts Andy Summers and Stewart Copeland in 2007-08. He has, however, been keeping his hand in with recent performances for the 21st birthday concert of the Rainforest Trust, which he founded in 1989; for the 40th anniversary of World Day in April; and for the Haiti Telethon in January. Sting is almost as well-known now for his activism as for his artistry, yet he remains a consummate entertainer at heart. Wild applause greeted the end of his Abbey Road set. For the last gig of the Police tour at Madison Square Garden he was joined onstage by his three daughters. It remains to be seen whether a duet with Coco is on the cards for the Symphonicities gigs. The 41-city, 47-date tour begins on June 2 in Vancouver. It reaches London later in the summer. For exclusive photos from rehearsals click here. "No one wants their money back! But I'm not surprised, it was one of the best shows I'd ever been in, or seen, it was incredible," Sting told Rolling Stone after the concert. "Bruce brought the house down because I told him he had to bring the house down. Gaga was incredible. I mean, forget it, it was just a brilliant show..."